National accreditation is a BIG step and necessary to achieve the highest level of Paths to QUALITY™. There are so many questions that choosing the right accrediting body can be overwhelming. Which one is right for my facility? How long does it take? Am I eligible? What do I need to do next? This page is designed to help you answer these and many other questions! While there are many accrediting bodies available to early childhood education facilities, only six are approved for Paths to QUALITY™ Level 4. 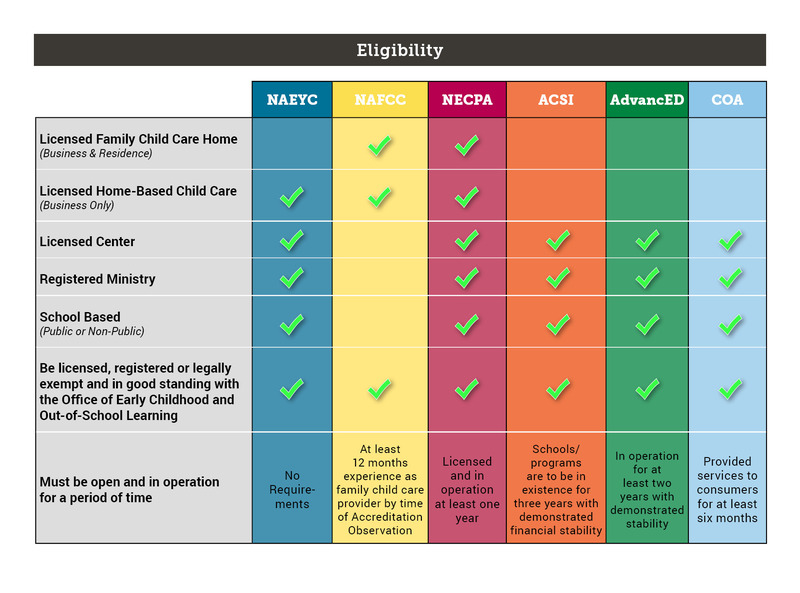 The table below shows you as a Home, Center, Ministry, or School for which accrediting body your facility is eligible. Now that you have decided for which accrediting body your facility is eligible, it is important to consider your timeline for accreditation and find an accrediting body that make it possible for you to meet your goals. 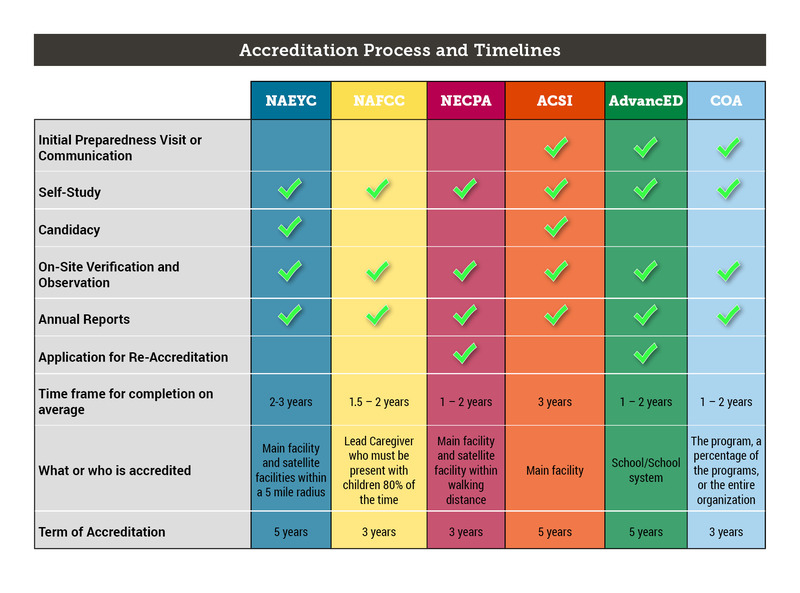 The table below give you an overview of the steps to accreditation and time average amount of time it takes a professional or facility to become accredited by each accrediting body. Do I and my staff have the appropriate education and training? One of the most important factors to consider when choosing an accrediting body and defining your timeline is education and training requirements. Below you will find a table that provides an overview to the education, training, and experience requirements for each accrediting body. Find the row with that aligns with your education level and follow it across to see what accreditation options best fit you! Remember if you need more education to become accredited, T.E.A.C.H. Early Childhood Indiana® provides scholarships to many of the higher education and technical institutions in Indiana. What documents will I need to gather for accreditation? Documentation in the form of policies, forms, and pictures, are the best way for you to tell the story of your unique facility to any accrediting body. So, there is A LOT to gather. 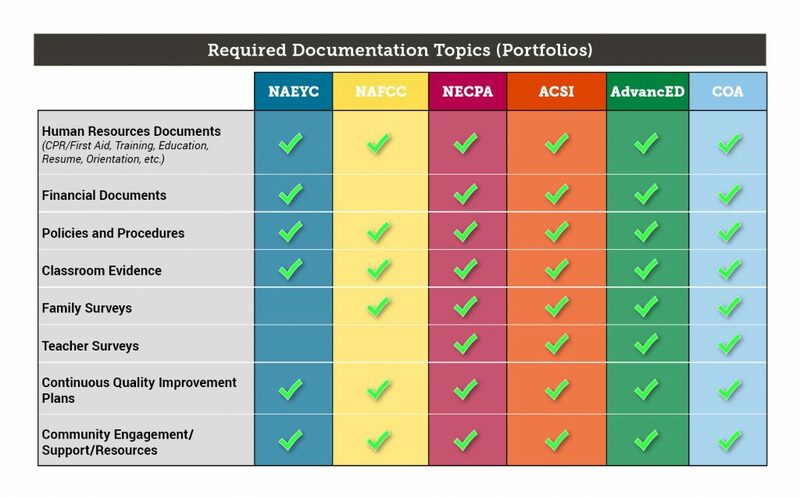 The table below gives you an overview of the type of documentation that you will need to access for each of the accrediting bodies. Is there an overview of each accrediting body? Yes there is! Below you will find links or videos that provide you with an overview of each accrediting body from the accrediting body, because no one can explain it better than the accrediting body themselves. An Introduction to COA Accreditation from Council on Accreditation on Vimeo.